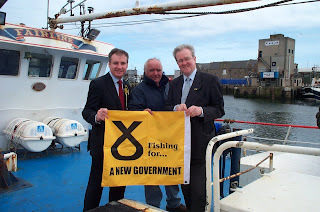 By backing the SNP on May 3rd, Scotland can elect Scotland's first ever pro-fishing Government and pro-fishing First Minister claimed SNP Fisheries Spokesperson Richard Lochhead today. Speaking during a visit to Peterhead today, Mr Lochhead announced a 15 point action plan for fishing and promised that an SNP Government would deliver a new era for Scotland's fishing communities. "Scotland has the opportunity to elect Scotland's first ever pro-fishing Government and pro-fishing First Minister by backing the SNP and Alex Salmond. "An SNP Government will take our fishing communities into calmer waters and better times. We will champion one of our most valued traditional industries and provide a voice for our fishermen within the UK and Europe. "Following decades of betrayals by successive Tory and Labour Government in London, our fishing communities expected better from the first eight years of devolution but the Labour-Lib Dem Government in Scotland abandoned our fishing communities and allowed cut after cut to be imposed on one of our vital industries. "Scotland has a world class fishing industry that continues to sustain tens of thousands of jobs at sea and onshore in processing and around our harbours. The sector generates billions of pounds for the economy. It deserves better and to be treated as a national priority. "The SNP will work to deliver stability and certainty for the industry in place of the turmoil and uncertainty of previous years. Our aim is to create optimism and a sustainable fishery backed by sound conservation. "Scotland has one quarter of Europe's seas and many plentiful stocks yet our fishing communities are left with an ageing fleet and skills shortages. Our action plan will arrest the industry's decline and begin to reverse the damage inflicted on the sector. "The SNP will also begin the journey towards bringing control of our seas back to Scotland and removing the dead hand of the Common Fisheries Policy." · In Government, the SNP's First Minister will seek an early meeting with the UK Government to seek the lead role in the EU fisheries negotiations. With over two thirds of the UK industry based in Scotland, the Scottish Minister should be designated official lead of the UK delegation. · Likewise, we will meet with the European Commission to discuss the impact of the CFP on Scotland. We will also work with our partners to enlist support for the repatriation of fisheries responsibilities to member states. · Industry representatives will be seconded to ministerial teams participating in international negotiations to ensure that fishermen are listened to and are able to provide expert advice. · Fishing entitlement will be allocated only to active fishermen and coastal communities with historical rights. · The SNP opposes the introduction of Individual Transferable Quotas (ITQS) that would effectively privatise Scotland's historical fishing rights. · The essential role of the on-shore sector including the scores of companies that congregate around Scotland's harbours will be recognised and offered tailored support. · A strategy for the development and upgrading of Scotland's harbours will be produced. · The interest of our fishing communities will be taken into account during negotiations over forthcoming marine legislation to ensure that a balance in struck between competing economic and environmental interest. · the SNP will establish a Convention on the Future of Scotland's Fishing Communities to develop long term management plans to secure the sustainability of stocks of greatest importance to Scotland and to reach a consensus on the way forward. · A Development Plan for the Fish Processing sector and seafood companies will be published. · We will ensure that locally caught and processed fish products play a central role in our local food and healthy eating agendas and that public procurement budgets are used to further this aim. · The marketing of fish will be made a priority and Seafood Scotland strengthened. The role of the new food promotion body along the lines of Ireland's Bord Bia proposed by the SNP will be discussed with the industry. · The burden of overly complex regulation on the industry will be tackled. The Scottish National Party has launched ITS Manifesto for Local Government in Aberdeenshire. The document - " A Manifesto for Aberdeenshire Council 2007" - sets out the priorities which an SNP-run Council will have if elected into office on 3rd May. It commits the Party to devolving more responsibility to the local Area Committees, thus better reflecting the needs and aspirations of the people of Aberdeenshire; to improving nursery school provision and working towards reducing class sizes in primaries 1 and 2; to amending the Structure and Local Plans relating to house building in the countryside; to implementing a waste strategy centred around waste minimisation, re-use and recycling and to revisiting the current Aberdeenshire Waste Management Scheme to ensure that all waste, recyclable and residual, is collected and disposed of efficiently. The Manifesto highlights how an SNP administration in Aberdeenshire will work to ensure the area has a vibrant and diverse economy, with advice to new businesses, encouragement of sustainable working practices, promotion of rural businesses and ensuring there was an adequate supply of serviced land to facilitate economic development. "The SNP has consistently offered alternative policies in education, infrastructure and social services to reflect the concerns of the people of Aberdeenshire. We have been at the forefront in defending the traditional industries of farming and fishing. It's time for a new and effective administration in Aberdeenshire." "The ruling coalition of Liberal Democrats and independent councillors have run Aberdeenshire for the last 11 years. May 3rd gives voters the chance to vote for a new Government for Scotland and for a new council administration here in Aberdeenshire. It's time for an SNP-run council." 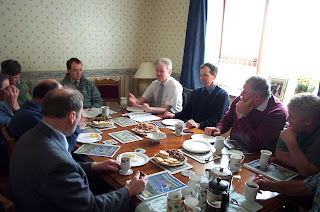 Banff & Buchan SNP candidate Stewart Stevenson met with farmers at Meikle Toux Farm, Cornhill, Banffshire to discuss the SNP's "Farming Manifesto". In keeping with North-east tradition, the event took place with "a fly-cup and fine piece" in mid-afternoon. Commenting, Mr Stevenson said:"It's time for a Government who will give rural Scotland the priority it deserves. The needs of agriculture and the countryside have slipped off the agenda of the current Liberal/Labour administration. "The SNP stands full-square behind Scottish farming which is why we want to see the industry reinvigorated with a support scheme for new entrants, similar to that which has proved so successful in Northern Ireland. "We also want to rein in the bureaucracy of agencies like SEPA which employ more and more staff and seem to fund this expansion through ever-increasing burdens on farmers. "These are just two of the actions which Government can take to support Scottish farming and which is why I am proud to stand on a manifesto which offers the industry that support." One good (comic) turn led to another for Forglen Hall who are benefiting to the tune of £100 from the comedy efforts of MSPs. Last month, the Stand Comedy Club in Edinburgh invited a number of MSPs to perform a stand-up routine in advance of the election for their patrons. Each was offered a £100 fee and Stewart Stevenson nominated the Friends of Forglen Hall as a worthy cause to receive his fee. "It was an interesting experience and I'm pleased that I accepted the invitation to take part in it. However, I don't think I'll be pursuing a career as a professional comedian. "I was pleased to nominate Forglen Hall as a worthy recipient of the fee which I was offered for taking to the stage for a modest amount of time late one evening. "I know that the Hall Committee are very pro-active with their activities ranging from Doric Concerts to Christmas Fairs so I'm delighted to be able to help them in this way." SNP Scottish Parliament candidate for Banff & Buchan Stewart Stevenson , has highlighted the issue of the lack of access to NHS dental services as one of the most frequently raised issues during the current election campaign and one of huge concern throughout Banff & Buchan. “At my surgeries as an MSP, and now on the doorsteps of Banff & Buchan during this election campaign, many people have complained that they have not been able to see a dentist for years now. This is a matter that I have frequently raised with NHS Grampian and in Parliament with Health Ministers. “Those dentists in the area currently providing an NHS service do a fantastic job, but they simply cannot cope with the numbers who wish to have NHS treatment and they have to draw a line somewhere. ”There has to be much greater attention and focus on the detail to bringing key personnel to the area, and in particular at Scottish Governmental level, more vocational training posts to bring new dentist into the NHS. ”There has to be much greater flexibility given to attracting people to the North-east from outwith the area in order to provide such key services, and in particular, faster recognition of foreign qualifications – as those with skills such as dental technicians and hygienists are far too often snarled up in bureaucracy rather than starting working under the NHS. SNP Candidate for Banff & Buchan Stewart Stevenson, along with many thousands of people across Scotland and the world watched the first ever broadcast of SNPtv. "This campaign is quite unlike any previous one. We have to reach out to the people of Scotland in as many ways as possible. "Television has a unique ability to communicate concisely and to be remembered. That is why the launch of SNP tv is so important. "The first broadcast contained an inspirational message from Sir Sean Connery and an interview with Scottish political icon, Winnie Ewing. Enterpreneur Tom Farmer explained why business support for the SNP has never been higher. "All showed why now is the time for the SNP." 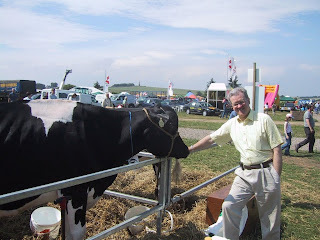 Banff & Buchan SNP candidate Stewart Stevenson will highlight the Scottish National Party's commitments to the agriculture industry at a gathering at Meikle Toux Farm, Cornhill, Banffshire AB45 2XB on Tuesday 24 April at 3.00pm. In keeping with North-east tradition, as the event takes place at 3.00pm (flytime), those attending will be offered "a fly-cup and fine piece". "It's time for a Government who will give rural Scotland the priority it deserves. The needs of agriculture and the countryside have slipped off the agenda of the current Liberal/Labour administration. Local business people from Banff & Buchan are among one hundred business supporters who have signed a statement published in national newspapers backing the Scottish National Party. The full-page advertisements state: " Scotland can be more successful. That is why we are supporting Alex Salmond and the SNP on May 3." The SNP's business supporters range from household names and internationally-respected business leaders - such as Kwik-Fit founder Sir Tom Farmer, former Royal Bank of Scotland chairman Sir George Mathewson, Stagecoach boss Brian Souter and ex-chief executive of Scottish Enterprise Crawford Beveridge - to those nurturing growing businesses from every sector of the economy and from all around the country. "The SNP have laid out plans for a lean and light government and strong proposals to grow the economy. I fully support the need for progress and the 3 May election gives us the opportunity to bring this about. "I want to see Scotland go forward and the next Scottish Parliament must have the vision and willingness to work with everyone – business people and the wider community – to ensure Scotland prospers. "I have come to the conclusion that the SNP led by Alex Salmond has the ability and the proposals to take Scotland forward, and they have my full support and my vote." "This is a hugely significant moment in the Scottish election campaign. The SNP are winning the debate on the Scottish economy, just as we earning the trust of the people to win the election. "The SNP's plans for the economy – including freeing 120,000 businesses from the burden of rates, and reducing them for 30,000 more, to allow them to grow and provide more and better paid jobs – will help make Scotland flourish. "It's time for a more successful Scotland. It's time for the SNP." THE Scottish National party is on course for a decisive victory in the Holyrood election, according to the most comprehensive survey of public opinion since the campaign began. With only 11 days to go until polling, the SNP continues to extend its lead over Labour, which now requires a seismic turnaround in its fortunes to avoid defeat. A YouGov poll for The Sunday Times puts the SNP seven points clear of Labour in both the first-past-the-post and regional votes for the Scottish parliament. In the constituency vote, the SNP is on 37%, Labour 30%, the Liberal Democrats 15%, the Scottish Conservatives 14% and others 4%. In the regional vote the SNP is on 35%, Labour 28%, the Tories and Lib Dems 13% and other 11%. If replicated in the election on May 3, it would put the SNP on 50 seats, eight ahead of Labour, with the Lib Dems on 18, the Tories on 16, with the Greens capturing two seats and independent candidates fighting over a single seat. PETERHEAD. When you see the building that is the HQ of the Conservative Party in the Scottish constituency of Banff and Buchan one thinks that it is a social force that perhaps had relevance in the past. When one speaks with those inside one concludes that the Scottish conservatives do not have future. The building is next to the police station on the sidewalk of a traffic island in Mintlaw, a pleasant and gentile town, with a fish processing factory in a mainly agricultural region. The building is modest, with British and Scottish flags on its masts. There, four members of the party work on electoral tasks and the candidate, Geordie Burnett Stuart, is enchanting to the visitors with an entertaining biographical and political story. He was a Labour Party member, a Social Democrat, a Liberal. “Now I am unionist” he says, “because the union is in danger and I believe that it is a modern and progressive idea”. Perhaps the ideological mobility of Stuart is a problem for the voters, but Stuart recognizes that there is nowhere else to begin the conversation. The most evident problem that he has as a candidate, the one most obvious to the ear, is that he “speaks in English”. He does not mean that the rest of the population speaks in another language - in this part of the northeast of Scotland, gaelic is rare and most natives speak a local dialect - “doric”, but that he speaks with the phonetics of an Englishman in an area where people speak in a different way, with strong consonants. Here, nevertheless, in this electoral area, the conservatives regularly sent their representative to Westminster. Until, in the Seventies, when everything began to change. From 1987, when the present leader of Scottish National Party (SNP), Alex Salmond, became candidate and was elected, that party has increased its majorities in each election, both to the Parliament at Westminster or the one in Edinburgh, created in 1997. More than half of the population usually now vote for the independentista candidate. And in the building in Mintlaw the reasons for this are explained. The Conservative Party was paternalistic; the common fishing policy of the then European Economic Community created real difficulties in the area; and the nationalists were successful in establishing the question of the union or independence, of the Scottish power, as the main issue. For example, to Geordie Stuart, the legislative devolution of Tony Blair seems to him “a disaster which we failed to prevent”, but, now resigned to operate in the devolved parliament, he wants, if successful in the elections, to reform the Scottish Government. According to him, the minister of Fishing in Edinburgh should lead the British delegation in the European negotiations. Stuart will not be successful in the elections. At least, he will not be in this seat. Until David Cameron there had been no hope of revitalizing a declining and aging Scottish party. Stuart will not gift a pleasant surprise to Cameron. Banff and Buchan will vote for a member that favours independence. The region is a peculiar mixture of wealth and austerity. It is a beautiful and cold place, with dark houses of granite and slate tile roofs. There are not the devastated districts there such as the de-industrialization in central Scotland has left, in the urban strip around Glasgow and Edinburgh. In addition to the farming wealth, the area has fishing towns - Peterhead, Fraserburgh, Macduff- that are the capitals of the refined cuisine in United Kingdom and of a significant and successful processing industry. The nights of St Fergus are extraordinary. A constellation of light bulbs illuminates the dark from the terminal of gas coming from wells of the North Sea. It sends 15% of the gas consumption in the British economy. The northeast of Scotland is the region next to the petroleum of the North Sea, that has pumped the British economy from the Seventies, at the same time that the entry into the EEC forced the fishing sector to give up sovereignty of its waters, to negotiate with others a system of quotas, to reconstruct themselves without apparent benefit. Petroleum and the fishing were important in the slide towards nationalism in this region, but the subject is not only in that, according to Stewart Stevenson, the nationalist parliamentarian of the area, who will certainly be re-elected in the elections of next the 3 May. The SNP has a variety of people with the professional capacity to govern. Stevenson was responsible for technology of the Bank of Scotland. His old friend, elected to represent this area at Westminster and leader of the party, Alex Salmond, was oil economist of the Royal Bank of Scotland. The nationalists are, with their ideology left of center, a the clear alternative to the conservatives unlike the dominant labour party, that, according to Stevenson, has shown in administration a high degree of incompetence and has encouraged a culture of dependency and subsidy. “We want to wake up the energy of our society”, he says. They want, in addition, with a nationalism that explicitly rejects definition by identity, to separate from the British Treasury, to control through an independent Government the resources of the petroleum of the North Sea and, although are not eurosceptics, but pro-European, to leave the common fishing policy, to repatriate territorial waters and to promote bilateral agreements rather than depending on Austrian lawyers or political Maltese decide to the fate of their fishing. If in Banff and Buchan, the SNP has replaced to the conservatives as the party of aspiration, its challenge is now in challenging bastions of the Labour Party. Here a first step occurred. And the pollsters say that they will be leading in May. A BANFF pensioner was left without an emergency prescription because of changes in medical deliveries to the North-east. Pharmacist Bruce Scott was unable to supply a customer with his medicine. The man, in his 70s, was told by doctors that he would have to go to Aberdeen Royal Infirmary for a scan because of fears that his deep vein thrombosis had worsened. But when he went to pick up his prescription from Bruce Scott's on High Street, Banff, he was told that the anti-coagulant would not be available in time for the scan the next day. It is the latest in a series of cases that have come to light following global drugs firm Pfizer's decision to review their distribution system, which involves them now using a depot in Livingston, near Edinburgh. Medicines are sent out to pharmacies, hospitals and doctors exclusively by UniChem, which has no distribution depots north of Livingston. Ordering deadlines for North-east chemists have been brought forward from 1pm to 10am. Mr Scott told the 'Banffshire Journal' that he and other chemists were concerned and were keeping track of problems. "They have brought the cut-off time forward. I could place an order up until 1pm, but now it's 10am," he said. "If we get scripts that are of an urgent nature between 10am and 1pm, there is a possibility a patient could end up in hospital. "A gentleman who required an injection needed an anti-coagulant; he was going to get an emergency appointment for a scan the following day. But because we could not get the injection required, to be administered here to him, that was cancelled." Mr Scott said that the health of the man, who has not been named, could have been placed in danger. "There was a problem there. He could have been hospitalised because we couldn't obtain that prescription in time," said Mr Scott. "There has been a few other things. We are monitoring all these different things that are happening. We all knew that this would happen. but there was no consultation with community pharmacies." Mr Scott's concerns, along with those of a number of other pharmacists throughout the country, have been noted by rival pharmaceutical firm AAH, who have passed the information on to politicians, including Banff and Buchan MSP Stewart Stevenson. Mr Stevenson has raised the matter with Health Minister Andy Kerr. He said: "I am absolutely appalled that the consequences of this are that at least one person has had their hospital appointment cancelled because the required medication for them to take at home in advance of their hospital visit could not be delivered in time. "This is exactly the sort of problem that pharmacists flagged up with me and which Pfizer were told repeatedly would be an inevitable consequence of their new distribution system. "I know that the Health Minister has expressed similar concerns after I raised the issue with him last month and that he, too, has written to Pfizer." Pfizer were unavailable for comment at the time of going to press. A DESCENDANT of Banff who became an 18th century Prince of the Russian Empire was commemorated with a life-size statue worth £200,000 last month. The monument that was worked on for a year by a team of four, is in the city of Chernyakhovsk, in Russia, and celebrates Michael Barclay de Tolly, a descendant of Sir Patrick Barclay of Towie, who lived 400 years ago in Banffshire. Local MSP Stewart Stevenson, who attended the unveiling ceremony, told the 'Journal' that there were about half a dozen television crews on hand to capture the event for Russian viewers. Chernyakhovsk officials are keen that a plaque commemorating Michael Barclay de Tolly be put on a suitable building in Banff, according to Mr Stevenson. Descendents of the de Tollys were also invited along to the ceremony and the 'Banffshire Journal' made an appeal in January for relatives to come forward. And last week a de Tolly contacted the paper by email from the United States, saying that there were a number of his descendents now living there. Michael (1757-1818) became Minister of War, Field Marshal and Prince of the Russian Empire, and was one of the heroes of the Russian Army during the wars against Napoleon. The Mayor of Chernayhovsk, where Tolly died, invited both Aberdeenshire Council and the Scottish Parliament to send representatives to participate in the unveiling of the new statue on the last day of March this year. In the event, the date was finalised less than a week before that and only Mr Stevenson was able to make the very brief visit. He said: "The Chenayhovsk 'savet', their council, had laid on a typically Russian celebration to ensure that the whole of Russia knew that they were honouring a man who spent his last days in their community and who is to this day a legend in his adopted country. "The military paraded before the guests, including myself, and about half a dozen TV crews recorded the day. Speeches were focused on how much a Scot had meant to their community. "I was warned to restrict my speech to two minutes – and with some large Russian soldiers at my back, I did. "When we pulled the silk cover off the statue a fusilade of fireworks temporarily deafened me. A crowd many thousands strong cheered. "When I returned at about 11.30pm to photograph the statue for the 'Banffie', there were still many locals admiring the statue and reading of Barclay de Tolly's origins in Scotland on the plaque in front." "I know that the Council still want to arrange for one of their members to go the Chernayhovsk at a later date. They will be very welcome and encouraged to create permanent links between our communities. "I was presented with a large bronze medal which I accepted with the intention that it should be given to Banff museum. "Chernayhovsk officials are very keen that a plaque commemorating Michael Barclay de Tolly be put on a suitable building in Banff. They would like to visit our community and participate in its unveiling. Stewart Stevenson was presented with a large bronze by international sculptor Vladimir Surovtsev (right) from Moscow. "That is something I hope the new Council will be able to support." Amy Barclay contacted the 'Banffie' last week and revealed that there are a number of de Tollys in America. She said: "I am pleased to tell you that I have one of the youngest Barclay de Tollys snuggled in next to me, my daughter. "Her grandfather, George Barclay de Tolly emigrated to Canada from Poland following World War II. He married a lovely Canadian woman, Muriel, and they immigrated into the United States in the 1950s. They have six children, all residing in the New England area. George and Muriel have seven grandchildren ranging from ages 21 to the youngest three. As far as we know, these children are the last of the Barclay de Tollys, with only three carrying the family name." In 1621, Peter Barclay de Tolly, a merchant and kinsman of Sir Patrick Barclay of Towie, left Banff for Rostock. In 1664 his son, John Stephen, a lawyer, settled in Riga and was still alive when the Russians conquered Livonia in 1710. But the name was immortalised in Russian history by Michael Barclay de Tolly (1757-1818). Son of an army lieutenant, he started his military career as a cuirassier N.C.O. He excelled in almost every campaign after the Russo-Turkish war of 1787-91, and became the first Russian Governor-General of Finland. As Minister of War, he went on to reform the Russian Army. Barclay de Tolly took part in the invasion of France in 1814 and commanded the taking of Paris, receiving the baton of Field Marshal in reward. In 1815 he served as commander-in-chief of the Russian army which invaded France, and was created a Prince at the close of the war. He died at Insterburg (the modern Chernyakhovsk) in Prussia on May 26, 1818, on his way back to Russia. A grand statue of de Tolly was erected in front of the Kazan Cathedral in St Petersburg at the behest of Emperor Nicholas I. Another monument to him was later built in Riga. 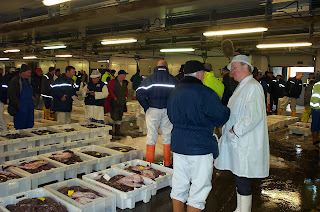 Banff & Buchan SNP candidate Stewart Stevenson paid a campaign visit to Peterhead Fishmarket early this morning. Mr Stevenson was accompanied by local SNP council candidates Stuart Pratt and Stephen Smith (Peterhead South & Cruden) and Anne Allan, Sandy Allan and Fiona McRae (Peterhead North & Rattray). "Scotland's fishing industry provides tens of thousands of jobs and generates billions of pounds for the Scottish economy. It also provides the heart of our coastal communities here in Banff & Buchan who depend on the success of that industry. "Fishing is vital to our local and national economic interest and should be given the support that it deserves. The UK has always given, and always will give, fishing a low priority status but the SNP will give it the representation it deserves." "Just as the fishing industry is so important to Scotland's economy, so the harbour is to Peterhead. I was pleased to hear that Peterhead Port Authority is doing so well at the moment and I congratulate John Wallace and his team on their vision for the future and commitment to ensure that Peterhead remains the country's pre-eminent fishing port." Banff & Buchan SNP candidate Stewart Stevenson has welcomed the commitment made in his party's manifesto to the long-term future of Peterhead Prison and its rebuilding. Mr Stevenson was speaking following the launch of the Scottish National Party's manifesto for the Scottish Parliament elections yesterday. The SNP candidate, who is also his party's spokesperson on prisons, has been campaigning since he was elected in 2001 for the prison which resulted in the then Justice Minister Jim Wallace overturning the decision to close it. Most recently, Mr Stevenson met with Justice Minister Cathy Jamieson with members of the Prison Officers' Partners Committee in February to continue to press the case for Peterhead Prison. "Obviously I am delighted that my party has signalled its commitment to Peterhead prison in this way by including this in the SNP Manifesto. "People in the North-east are aware of the SNP's relentless dedication to this campaign. They can be sure of rapid action on this issue from an SNP Justice Minister in the next term. "However, a decision before the election by the present government could have ended this unnecessary delay. This is a clear reflection of the Lab-Lib coalition's lack of commitment to the criminal justice system and to prison staff employed in our area." SNP candidates for Central Buchan Sandy Stronach and Norma Thomson have criticised the latest announcement from the Labour Party as discriminating against rural pensioners. Labour's panicked response to growing anger against the Council Tax by saying they could lower water and sewerage rates for pensioners is set to discriminate against people living in the country. SNP candidates for the largely rural ward of Central Buchan were quick to point out than a great many people in rural areas have their own water supplies and septic tanks and so will not benefit from this move to reduce the council tax burden. Instead, they have backed the SNP policy of scrapping the council tax and replacing it with local income tax, which will be of great benefit to all pensioners. "To say that all households pay water and sewerage charges is patent nonsense. The point of Labour's proposed reduction in water charges is to make the council tax look better because the two charges are collected together. "But if you live in the country and maintain your own water supply and pay for your own septic tank maintenance and emptying, then you are not going to benefit from any reduction in water charges. "The move is ill-thought out and actually discriminates against those living in the countryside." "Council tax is a huge issue on the doorstep and I am finding that people are very supportive of the SNP proposal to scrap the council tax completely and replace it with local income tax. "Local services have to be paid for, but the council tax is not the way. It has increased 60% since Labour and their Lib Dem allies came to power but the state pension or peoples' incomes have certainly not increased by the same amount. "It's time for a fairer method of payment for our local government services and that means it's time for the council tax to go." A Sick north-east pensioner had to scrap a crucial hospital appointment after a delay getting his medication. The Banff man, who is in his 70s, needed an emergency scan at Aberdeen Royal Infirmary when it was feared his deep-vein thrombosis had worsened. Doctors told him that before the check could proceed, he needed a pre-scan injection of dalteparin sodium, or Fragmin. But because of a change in the way medicine is distributed to pharmacists across the country, he found it was impossible for him to get the injection in time for the scan the next day and he was forced to scrap his appointment. It is one of a number of similar cases which have come to light following global drugs firm Pfizer's decision to review its distribution system. The company's medicines are now sent out to pharmacies, hospitals and doctors exclusively by UniChem, which has no distribution depots north of Livingston in West Lothian. This means that ordering deadlines for chemists in the north-east have been brought forward from 1pm to about 10am. Earlier this month, the Office of Fair Trading (OFT) revealed it had launched an inquiry into the cost implications of the Pfizer move for patients and the NHS. Banff pharmacist Bruce Scott, who served the unnamed local pensioner, said: "A few months ago it would have been easy to get Fragmin for this gentlemen the next morning from a depot in Aberdeen. "But when I phoned UniChem I was just told there was no way they could get it to us in time. They couldn't make any special arrangements and his scan had to be scrapped." Mr Scott's example has been highlighted - alongside the experiences of other pharmacists across the country - by rival pharmaceutical firm AAH, which is based in Coventry. The firm has collected complaints about the new arrangements from UK chemists and has passed them on to health ministers and politicians. North-east Holyrood hopeful Stewart Stevenson visited pharmacies in his constituency to check out the situation. He said last night: "This case at Banff is exactly the sort of problem that pharmacists flagged up with me and which Pfizer were told repeatedly would be an inevitable consequence of their new system." Pfizer is the world's largest drugs company and supplies about 10% of the UK's total medicine market. A spokeswoman for Pfizer said the new arrangements would counter the current "vulnerability" of the medicine supply chain in Britain. She said that last year there were three separate cases of counterfeit drugs found and gangs had targeted the supply chain. New jobs have also been created at the UniChem depot at Livingston to handle the new arrangements. Commenting on the news that a Banff man had an urgent hospital appointment cancelled because UniChem – who are now the sole suppliers of Pfizer drugs to community pharmacies – could not deliver a drug at the requested time, SNP candidate for Banff & Buchan Stewart Stevenson has called for the needs of patients to be paramount. Mr Stevenson has strongly criticised Pfizer after being contacted by worried pharmacists in his constituency who say that the plans will put at risk the security of supply of patient medicines in the North of Scotland and force them to deal with a wholesale firm which has no distribution depots north of Livingston. The SNP candidate has visited community pharmacies in Cruden Bay and New Deer in recent weeks hearing their concerns at first hand. "I am absolutely appalled that the consequences of this are that at least one person has had their hospital appointment cancelled because the required medication for them to take at home in advance of their hospital visit could not be delivered in time. "It completely vindicates the concerns of all the local pharmacists I have spoken to and makes it even more important that the OFT investigate. I know that the Health Minister has expressed similar concerns after I raised the issue with him last month and that he, too, has written to Pfizer." A £350million regeneration programme and a new link for gas imports from Norway was predicted yesterday to extend the life of a north-east gas plant until at least 2021. Energy giants Shell UK and Esso Exploration and Production UK, a subsidiary of ExxonMobil, officially announced plans to pour the cash into their jointly-operated gas complex at St Fergus, near Peterhead, as well as their operations at Mossmorran in Fife. They also revealed that a 14-mile link between a gas supply pipeline from Norway and the 25-year-old Buchan site would allow the St Fergus plant to operate at full capacity again. The plans were hailed as a major boost for the north-east economy and for national efforts to meet energy demand. Shell and Esso said their investment would safeguard about 300 jobs at their sites, create a further 100 positions and help secure the UK's future energy supplies. St Fergus installation manager John Lang said: "We have fantastic infrastructure at St Fergus and Mossmorran. The aim is to keep these plants operating effectively and safely through to 2021." Mr Lang said that without further investment, Shell and Esso's operations at St Fergus would soon have been winding down as they had reached the end of their 25-year lifespan. Welcoming yesterday's announcement, SNP leader Alex Salmond said it vindicated his party's efforts to secure a tax concession for the St Fergus plant four years ago. 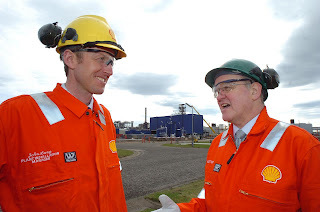 Holyrood SNP candidate Stewart Stevenson launched the project in the north-east, while Chancellor Gordon Brown performed the role simultaneously at the Mossmorran gas plant in Fife. Mr Stevenson said the plans were "great news" for Banff and Buchan and a vote of confidence in both the workforce at St Fergus and the future of oil and gas supplies from the North Sea. Speaking in Fife, the chancellor said the new link with Norway was good for the UK's energy supplies and for Scottish jobs. The natural gas plant at Mossmorran and the nearby Braefoot Bay loading terminal will both benefit from the investment. The plants at St Fergus and Mossmorran employ about 300 people between them. The numbers fluctuate but there are usually about 150 working at St Fergus. It is estimated that another 100 contract staff will be needed for the onshore improvements. Developments at St Fergus will include an overhaul of the plant's ageing equipment, with new technology being introduced in a bid to build strong foundations for future growth. The project will also address current skill shortages in the oil and gas sector through a strong focus on training and apprenticeship schemes, as well as links with Banff and Buchan College. With declining output from the UK North Sea, the new link to Norway is expected to play a major role in plugging the gap between demand and supply in the UK's future energy needs. 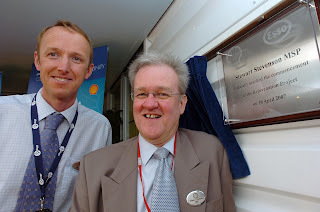 SNP Scottish Parliament candidate Stewart Stevenson officially launched a £350 million upgrade and investment by Shell in the St Fergus Gas Terminal today. Mr Stevenson was joined at the launch by Peterhead councillor Anne Allan, who is Vice-Convener of the council's Buchan Area Committee. The investment secures 300 jobs at the terminal as well as creating work for contractors at the site over the course of the upgrade. Local SNP MP Alex Salmond lobbied and won a tax concession from the Treasury for the St Fergus pipeline in the 2003 Budget, to ensure St Fergus remained a competitive landfall point. Before the SNP's intervention, gas that arrived at St Fergus through the FLAGS system was taxed at 70%, a higher rate than in England and Belgium.
" I was delighted to have the honour of launching such a positive initiative and very much welcome the project. It is not only a vote of confidence for the North Sea offshore sector but will also secure gas supplies for consumers across Scotland for many years to come. "St Fergus is a very important part of the North-east economy and where most of the UK's gas comes ashore so it is a critical part of our energy infrastructure. "This major investment is also good news for local jobs and the local economy in Banff & Buchan. It will significantly contribute to the sustainability and viability of these rural communities. "I should add that this project would never have gone ahead had it not been for Alex Salmond's successful lobbying of the UK Treasury for a change in the tax regime which removed the tax burden on pipelines into St Fergus and allowed it to compete on an equal footing with terminals in England and Belgium. "Today we are reaping the benefits of the SNP's sustained efforts to protect and promote Scotland's oil industry. An SNP government will release the potential of Scotland's oil and gas and invest its profits in the future of our nation for generations to come." SNP Leader Alex Salmond MP welcomed the Shell announcement for a £350 million investment programme securing hundreds of jobs in the gas industry. The five-year plan upgrade involves supplies of gas from Norway being piped to St Fergus, north of Peterhead. "This is an extremely welcome development. The hard won Budget tax concession in 2003 lobbied for by the SNP has helped ensure the future of the industry, which is extremely bright. "Despite Gordon Brown's politically motivated attempts to talk down the industry, the reality is that there will be revenues of £55 billion from the North Sea over the next six years, compared to £34 billion over the last six." "This is a tremendous boost for the Buchan area and secures the future of one of our key local industries. "Having employers such as Shell in the area gives a tremendous breadth and depth to the range and number of skills opportunities which can be used locally and we are very fortunate in this regard to have both the companies based at St Fergus and the training available from Banff & Buchan College." SNP candidate for Banff & Buchan Stewart Stevenson has launched an attack on SEPA, the Scottish Environment Protection Agency, for spending over £7 million on consultants. Mr Stevenson - a long-standing critic of SEPA - earlier this year attacked the agency for charging farmers for using tar planings from roadworks to mend their farm tracks while the Environment Agency in England had adopted a common-sense approach and had waived its charges in a bid to encourage re-use and recycling of the material. Stevenson also criticised SEPA for charging higher costs in relation to the IPPC regulations than the Environment Agency. Mr Stevenson obtained the figures in a letter from SEPA which shows that between 2000/01 and 2005/06, SEPA spent a total of £7,112,913 on consultants. Since its inception in the mid-1990s, SEPA's own staff numbers have doubled. "These figures are flabbergasting, particularly coming from an organisation that has seen an explosion in the numbers of staff it employs directly. "One would expect the need for consultants to decrease as SEPA's own staff numbers rise, but the truth is quite the opposite as from 2000/01 to 2004/05 the annual spend on consultants rose year on year. "it is no wonder given what we are now discovering about SEPA that its charges levied on farmers are as high as they are. "This is simply further confirmation that a root and branch shake up of SEPA is needed. An SNP Government will do just that after May 3rd. It's time to rein in this out-of-control bureaucratic nightmare." Farm subsidies worth more than £12.5million and covering in excess of 163,000 hectares have been traded by Scottish farmers. The figures - revealed in a parliamentary answer by Environment and Rural Development Ross Finnie to former Moray MSP Richard Lochhead - also show that up to March 2 there had been 838 individual businesses authorised to acquire the rights to the subsidy entitlements disposed of by 1,252 farmers and organisations. The disclosure of the figures for the first time gives an indication of the scale of subsidy trading since the single farm payment entitlements were given to farmers in 2005 as part of the Common Agricultural Policy reforms. But the statistics only present part of the story and the way they have been released has been branded meaningless by those trading them as the value shown in the executive's figures does not reflect the market price. Generally entitlements over the last two years have traded between 2.5 to three times their annual value. Conservative estimates would indicate that the entitlement market may be worth at least £25-£30million, much of which will have been intra-farm and estate trading. The figures to March 2 showed that in total there had been 2,761.37ha/u of set-aside and 163,596.54ha/u of standard entitlement transferred between registered farming businesses. Mr Finnie acknowledges that 22 of the businesses involved in acquiring entitlements had what he termed "correspondence addresses" outside Scotland. One of these is outside the UK. The minister also revealed in a separate answer to former Banff and Buchan MSP Stewart Stevenson an increase in the number of businesses holding entitlements outwith Scotland. In 2005 there were 71 farm businesses elsewhere in the UK receiving Scottish subsidy payments, but last year the figure increased to 87. The number of overseas "farm businesses" getting Scottish cash remains at eight - two each in Canada, Australia and Ireland, as well as one in France and the United States, all of whom shared between them about £100,000 in subsidies. Mr Finnie said that put into context the trade in entitlements involved 8.3% of all the farm businesses holding them. Acquisitions were made by 4.1% of all businesses. He added: "In volume terms, 3.8% of all entitlements have been traded and in value terms, the trading represents 3% of the scheme's annual expenditure." The trading of entitlements has proved a lucrative new market for auctioneers such as Aberdeen and Northern Marts, Wallets at Castle Douglas, Dingwall and Highland Marts plus a few consultancy firms including Hayes, McCubbin, Macfarlane and the Buccleuch Group. Aberdeen and Northern has been the market leader. But the trader said the way the figures had been presented was meaningless as while they were broken down into years they did not show the actual number of entitlements transferred in 2006, only those on the executive's database up to March 2 of that year and instead lumped all transfers after that date into this year's trading. He also questioned the data on the overseas traders, saying that while one of his clients was abroad the entitlement acquired was going to his estate in Sutherland. "The owner is a foreigner, yes, but he is bringing that on to his estate so that will mean money being spent on the estate. That will mean investment in it, on housing and accommodation and probably, too, his sporting interests in game and deer stalking, both of which are growth areas. "The executive is only telling part of the story, not the whole story. Quite how Richard Lochhead could make any sense of this response I am not sure. If this is the type of information given out by civil servants, then it's not helpful in the slightest." The trader estimated that the market in entitlements last year would have involved about £4million at least. "That is just the crude value of the entitlement, too. You have to remember that last year entitlements traded were publicly making 2.5 to three times their value. This year it is more around three times and some at 3.5." SNP Candidate for Banff & Buchan Stewart Stevenson hosted an event business event together with SNP MEP Alyn Smith in the Palace Hotel in Peterhead last night. The event, attended by Banff & Buchan business representatives, was organised to give them an opportunity to hear SNP business and economic policies and to discuss the various issues affecting local businesses with Mr Stevenson and Mr Smith. "Banff & Buchan clearly demonstrates what can be done for the economy and for employment with SNP representatives who stand up for local business. Unemployment is now 1.3% which is about a quarter of the Scottish average. "When the SNP won the Banff & Buchan seat in 1987, unemployment in the Peterhead area was over 1800. In January 2007 it was 350. That's still 350 too much but shows what can be done when we elect representatives like Alex Salmond who roll up their sleeves and fight to save local employment like Peterhead prison, Simmers of Hatton and, further afield, the former Buchan Meat in Turriff and 800 jobs at Fisher Foods in Fraserburgh." "The SNP's policy is to cut red tape and reduce taxes for small and medium sized businesses to give them a chance to grow to become the future medium and large businesses. Our Small Business Bonus will abolish business rates for all businesses with a rateable value of £8,000 and below. This will not only give small firms the vital breaks they need to develop but will also provide more and better jobs for our area and indeed for Scotland in general." "The SNP are striving to release the true potential of Scotland's economy. We are a country rich in natural resources and full of entrepreneurial spirit. However, we are being held back by endless red tape and a cripplingly high corporation tax. "In an independent Scotland run by the SNP we can gain the power to lower corporation tax like our friends in Ireland who have a rate of only 12.5% compared to 30% in the UK. Given the opportunity Scotland can join Norway, Iceland and Ireland in the arc of prosperity that surrounds her and become another prosperous, successful nation on the international stage." SNP Candidate for Banff & Buchan Stewart Stevenson has welcomed the launch by the Office of Fair Trading (OFT) of an investigation into the impact of pharmaceutical giant Pfizer's decision to restrict distribution to only one wholesaler in Scotland. The investigation will focus on the impact of the deal on competition in wholesaling, discounts granted to pharmacies and the NHS, and disruption to services. Mr Stevenson had previously called for an investigation into the move and had written to Health Minister Andy Kerr. Today's announcement follows a meeting between senior Pfizer representatives and Mr Stevenson and Maureen Watt where they raised the key concerns of pharmacists in their rural constituencies over the move, including disruption to delivery and discounting policy. In response, Pfizer gave an undertaking that they would look again at the discounts which they offer to community pharmacies. "I welcome this OFT investigation as recognition of our efforts to oppose this move by drugs giant, Pfizer. Their redistribution arrangement is anti-competitive and threatens to seriously disrupt the way smaller pharmacies operate and therefore the sustainability of the service in rural areas. "In a recent meeting with Pfizer representatives I impressed upon them the grave consequences of this deal for smaller pharmacies in terms of disruption to delivery and received an assurance that they would reconsider their discounting policy. "I am now particularly concerned that other pharmaceutical companies are likely to follow suit which will have severe implications for smaller rural pharmacies. To lose local pharmacies would be a major body blow to our health service in rural parts of Scotland. "I sincerely hope that this OFT investigation will have an impact by preventing further drugs companies from pursuing similar anti-competitive deals in the future." SNP Scottish Parliament candidate Stewart Stevenson and council candidate for Banff & District Ian Gray have warmly welcomed the announcement that the Scottish Traditional Boat Festival (SBTF) is to receive a stage one grant of £110,000 from the Heritage Lottery Fund. The grant is for the Portsoy Salmon House restoration project which is intended to develop the unused B-listed building considered to be of national significance to provide a base for the SBTF and to house and exhibition and interpretive centre as well as various other activities. 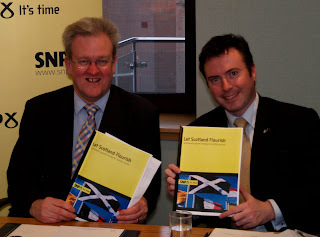 Mr Stevenson has been campaigning for more lottery funds for the North-east for some time and in 2004 organised a lottery roadshow in his constituency where he invited all lottery funding bodies to host an information stand and send representatives to talk to local orgianisations and individuals. The event was a huge success with queues forming outside before the event started. "This is excellent news for the Boat Festival, for Portsoy, and for the wider Banffshire economy because the Boat Festival has become one of our key annual events and attracts massive numbers of people each year. "I know from my travels around the constituency that lottery funding is put to very good use indeed and I will continue working hard to support local organisations to ensure that this continues. "I am always happy to support any organisation in their lottery applications if approached." "I am absolutely delighted for the Festival organisers and I congratulate all those involved with this successful application. "It's tremendous to have such a large amount of lottery funding coming to Portsoy in support of one of our key local tourist attractions. The Boat Festival provides a huge boost to the local economy each year and this will help it to go from strength to strength." Edinburgh: Scottish nationalists say they will insist on having a referendum on independence if they seize power in Edinburgh after the parliamentary elections on May 3. A senior figure in the Scottish National Party (SNP) told Gulf News his party would not accept a recent proposal from Liberal Democrats in the Scottish Parliament for a post-election cross-party convention to look at constitutional issues. Nicol Stephen, the leader of the Liberal Democrat group in the Scottish Parliament has proposed the convention so that his party would be able to form a joint administration with the SNP. The nationalist SNP is expected to take over from Labour as the party with the largest group in the Holyrood parliament after May 3, but is likely to need a coalition partner if it is to have a working majority in the 129-member chamber. Stewart Stevenson, an SNP Member of the Scottish Parliament (MSP) who is close to party leader Alex Salmond, told Gulf News the convention proposal was unacceptable. Second guess "I think it's time for the people of Scotland to make their decision, not for parties to sit down and try to second guess them. "I think we should trust the people and not sideline them," said Stevenson, who was elected an MSP in 2001. However, Lib Dem MSP Mike Rumbles said there was much in the constitutional convention proposal to give heart to those who favour reducing links to the UK Parliament. He told Gulf News the convention would "without a doubt" lead to increased powers for the Scottish Parliament, which first sat in 1999. Banff & Buchan MSP Stewart Stevenson has reacted angrily to the news that ombudsman body WaterWatch Scotland has received no response from Scottish Water to questions put formally to it in January. The questions – regarding Scottish Water's contract with meter-reading company H2O and on compensation for customers – were raised by Mr Stevenson at his meeting with Scottish Water and WaterWatch in Parliament in December. At that time, Scottish Water agreed to look into the matter and it was agreed that WaterWatch would pursue this issue with them. However, it has emerged that despite several reminders, Scottish Water have failed to respond to the ombudsman and a final request for information has had to be issued. "This display of arrogance on the part of Scottish Water simply beggars belief. "Scottish Water has not come out of this episode very well to date and they have now compounded this by snubbing WaterWatch in this way. "These are legitimate questions which I posed to Scottish Water at my meeting and which the ombudsman body agreed to pursue. For Scottish Water to treat the ombudsman in this way is a gross discourtesy to them, to an elected Member of Parliament and shows nothing but contempt for their customers in Peterhead on whose behalf we are acting. "The conclusion from this is either that Scottish Water are stalling because they have something to hide, or that the organisation is riddled with incompetence. I want to know which answer is correct."